Removes drum heads in about 30 seconds. 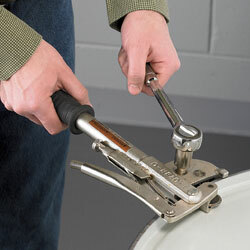 Unique tool operates similar to a household can opener, making drum deheading quick and easy. Deheader has a comfort grip handle and an inside cutting blade that wont leave sharp, jagged edges. Must use with a 1/2" manual ratchet driver (not included). Works well on all 30- and 55-gallon steel head drums. IN STOCK.